When it comes to politics in the small Texas town of Progreso, it’s safe to say the Vela family flexed some muscle. Omar Vela, 35, is the town’s mayor. 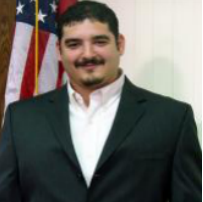 His brother, Michael Vela, 28 (pictured), is the president of the school board. And their father, Jose Guadalupe Vela, 64, works in management at the school district. All three are accused of participating in a “pay-to-play” scheme involving contractors, the San Antonio Express-News reports. Following an FBI investigation, the trio were charged in federal court Wednesday with conspiracy, mail fraud, theft and bribery. Special Agent Ricardo Ale testified in court Wednesday that the men ruled through intimidation and retaliation. The border town of Progreso has a population of about 5,000. Posted: 9/5/13 at 9:41 AM under FBI, News Story.